It took me a while to make these double strand connectors and toggle clasp, mostly because black seed beads are very uneven and I had to select all the beads one by one. 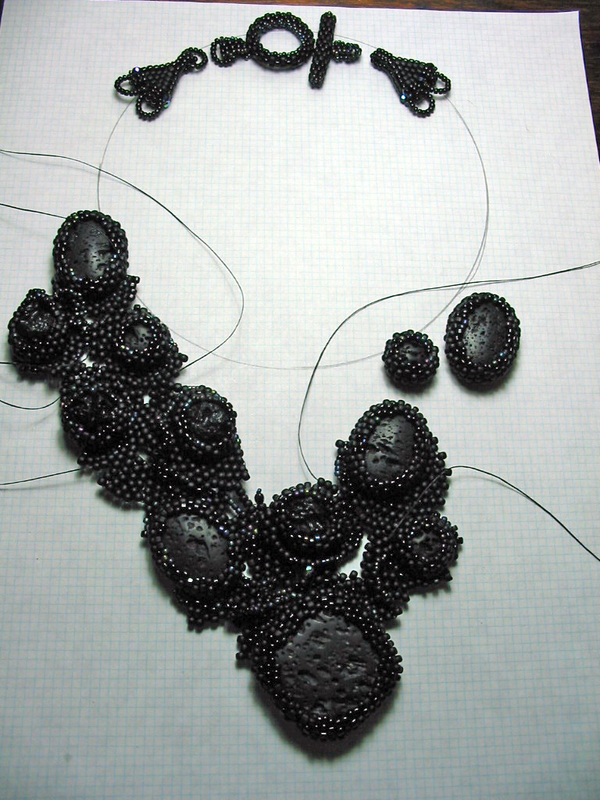 The other reason is that I weave through all the beads at least twice to reinforce and stiffen up the pieces. Making the little chain rings takes a little time too. To make them stiff and secure, I pass the thread inside the beads 4 times, then I pick up the other end of the thread and pass it through the beads in the opposit direction a 5th time and then, with both needles going in the opposite direction, I go through 2 beads at a time, applying a tiny dot of nail polish to the tiny loop that's between the beads before pulling it all through. I repeat this all around the ring. In this case the rings have 16 beads, so there are 8 dots of nail polish to secure the threads. Clear as mud? If you're interested, just let me know and I'll try to get photos, or make a drawing to show you how I do this.